There is a saying in Italy, “Natale con i tuoi. Pasqua con chi vuoi.” It basically means you spend Christmas with you family and Easter with whomever you’d like! Easter is a more relaxed holiday. Easter in Italy even goes onto the following Monday: La Pasquetta. Typically Italians go to eat outdoors, by the beach, in the mountains, on picnic. I just spoke with my aunt in Sicily and she told me my cousins went to the farm to eat only grilled meats. The torta Pasqualina is served as an antipasto at an Easter table. 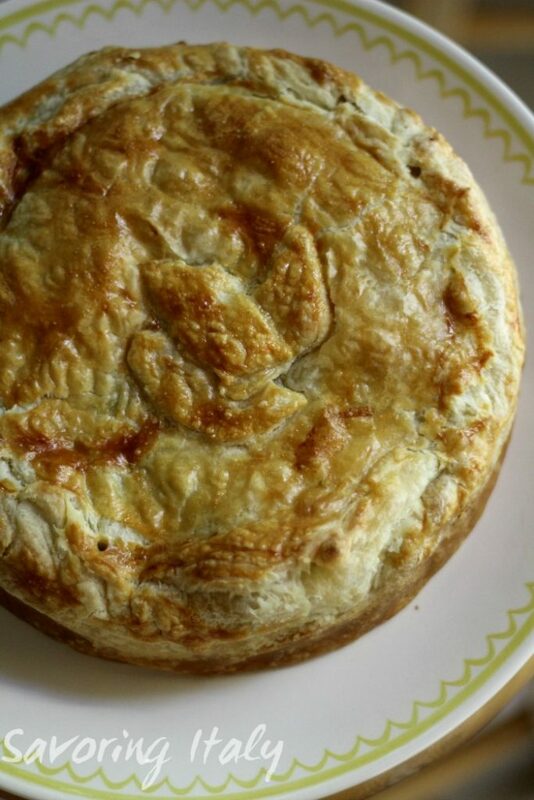 La torta Pasqualina is the most famous pie from the Liguria area. 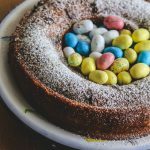 This delicious torta is also eaten during Easter outside of Liguria. The original version is one of the most ancient Ligurian recipes, where the dough is rolled into 33 separate layers, symbolizing the age of Christ at the time of his death. Today the torta is made typically with much less layers of dough. I’ve seen recipes for 12-18 layers and I’ve seen recipes with 4 layers of dough. The number of layers has now been reduced to 12-18–less symbolic but more practical. It?s a vegetable tart made with a very simple dough. The filling is usually made with ricotta cheese and spinach or artichokes, but the filling can be changed to highlight whatever green vegetables are in season. I found this little tidbit from Saveur: Traditionally, torta pasqualina was made with 33 layers of dough—ten on the bottom and 23 on the top—to symbolize the 33 years of Christ’s life. According to Genoese politician and gastronome Paolo Emilio Taviani, when Nietzsche lived on Genoa’s piazza Portello in the 1880s, he thought it worth devoting an afternoon to learning how to prepare a torta pasqualina from his aged landlady. 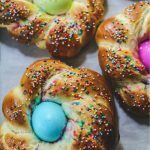 For this Easter, I baked the guti (Italian wreaths with eggs)and braided breads. The kids just love them and argue over who gets which egg. I baked some ricotta crostate and I also made this torta Pasqualina. 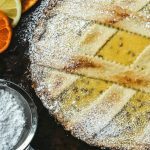 It is a typical Italian Easter pie that is from the Liguria region. 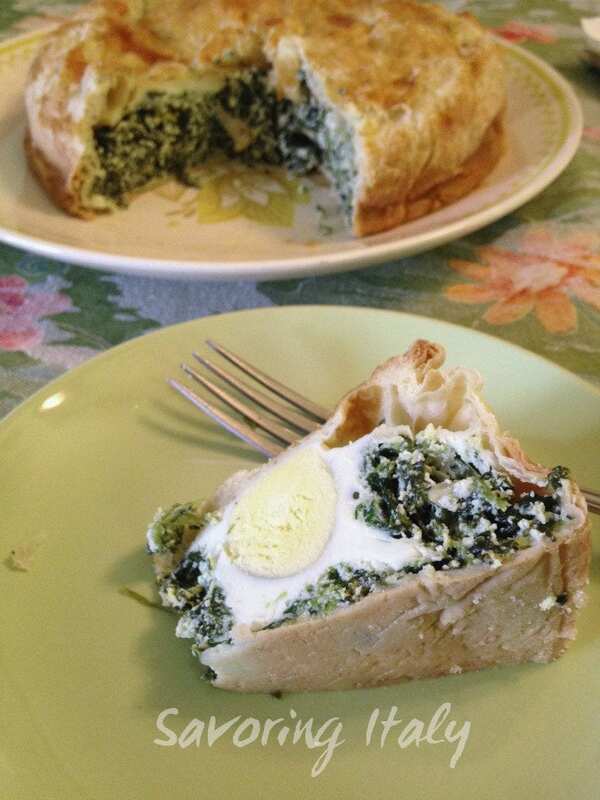 It’s a flaky crusted pie that is filled with a wonderful ricotta and spinach filling (or Swiss chard or really whatever seasonal green/spring vegetable you like). The dough for the crust is quite simple to make (just flour, olive oil and a little salt). I was busy baking crostate and Easter breads so decided to use puff pastry. It resulted in a very flaky crust. The filling can be Swiss chard or spinach sauteed with onion in olive oil. Fresh marjoram and parsley accent the delicious ricotta. A few eggs are nestled in the filling before the second layer of dough is placed on top. A quick egg wash gives it a lovely golden color. So easy to bake and a hit any time of year! Torta Pasqualina is wonderful at room temperature and perfect to take on your Pasquetta picnic. I followed along the recipe I found from the Academia Barilla. Preheat oven to 400 degrees F and grease a large pie pan or 10 inch springform pan with the butter. Bring a large pot of salted water to a boil. Remove the tough stems from the chard and add to the boiling water. Cook until tender, 3-5 minutes or shorter for spinach. Rinse in cold water, drain, and chop. In a medium bowl, beat together 4 of the eggs. Push the ricotta through a strainer into the bowl, being sure to scrap the underside of the strainer for excess ricotta. Mix in the Parmesan, bread crumbs, heavy cream, salt, pepper, chopped chard, and marjoram. On a lightly floured surface, cut the puff pastry into 4 equal pieces. Roll one piece until thin and large enough to cover pan with excess hanging over the edges. Brush with olive oil and roll out another piece. Place over first piece at an angle so the overhanging edges are not together. Cover the other two pieces with a damp cloth. 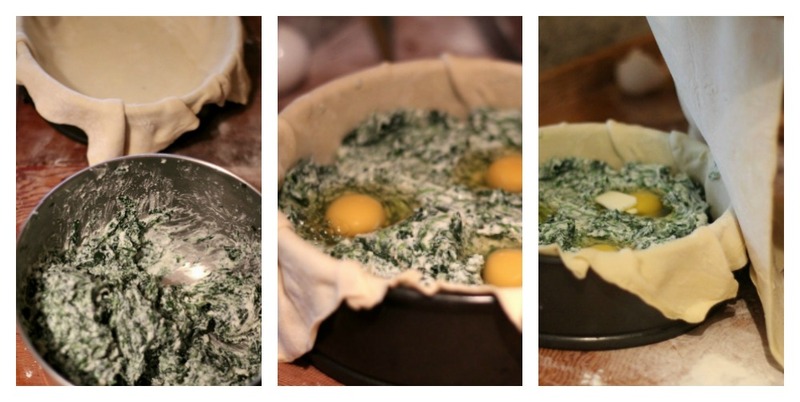 Pour half of the chard ricotta mixture into the prepared pan over the puff pastry. Use a spoon to make 6 indentations in the chard mixture in a circle. Break an egg into each indentation. Season with salt and pepper and cover with remaining chard ricotta mixture. Use a wet spatula to smooth the top. Roll another piece of puff pastry until thin and place over chard mixture. Brush with oil. Roll the remaining piece of puff pastry and place on top. Carefully crimp all of the edges the seal. Prick the surface a few times with a fork. Bake in preheated oven until heated through and top is golden brown. 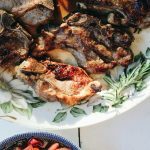 Allow to sit for 10 minutes before slicing and serving. Serve hot or cold. Oh my goodness that looks exactly as my nonna would make it!! What a beautiful torte!!! Great job! I've never seen this before! It looks so good! 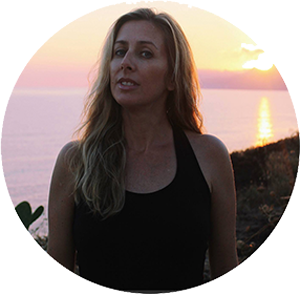 Lora, happy Easter to you and your family! This torts is absolutely beautiful! I'm in awe over that perfectly cooked egg in there. Going to get the recipe now! that just looks amazing and I would have loved to have had this for Easter! yum! Hum. That seems interesting. I wonder if my family would eat it. This looks delicious! I wish something this fancy would show up at my Easter feast! I think I could this whole thing BY MYSELF!